I figured I’d be okay carrying my cert just to get the bike home from my storage unit. Wow, was I wrong. The bike rides...well kinda messy if I’m honest. Second gear is sometimes iffy and the levers are so close to the footrests that I have to be on my tip toes to not accidentally throw it out of gear. I also would have needed to adjust the idle. But otherwise, it’s a hilariously fun bike that turns heads! It pulls decently hard, even at highway speeds. The petrol tank in this is interesting. 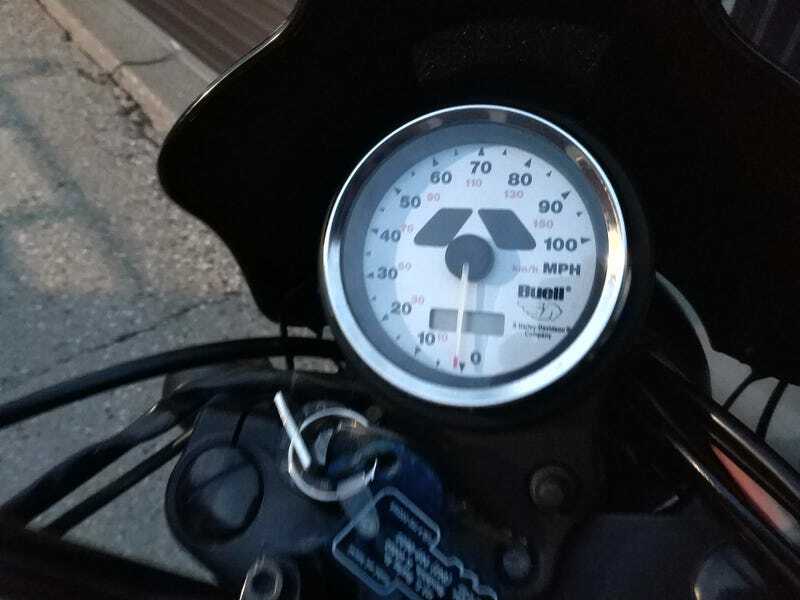 You’ll get maybe 100 miles max out of a tank and there isn’t a fuel gauge, so the trip odometer is your best friend. After about an hour fitting myself to the bike, I figured I should get it home and start my tweaks so I’m ready to ride it for reals. Well, none of that really seems to matter anymore. :( When I was just ten minutes from home, a police officer started tailing me. He pulled my plate, found out I don’t have a M on my license, then pulled me over. So he put me in the back of his car, searched my bag for imaginary weapons, then we sat for an hour for and talked bikes while a tow truck driver failed to figure out the clutch and just dragged it onto his truck. I then found out what to expect. I should get out of the ticket in court because I’ll actually have my license amended by then. However, the impound is pretty tricky. If I got the motorcycle out of the impound today, it will be $600. That number increases by $50 every day. I then can appeal the impounding and *maybe* get $400 back, however the bigger problem is that I don’t have $600 burning a hole in my purse that can disappear for two weeks or forever. I don’t know what to do. If I don’t get it today, I will probably have to let it get auctioned off because the impound prices will go out of control. :( I’d rather get another bike than do a short term loan or whatever. Well, I learned a lovely life lesson the hard way today. And by reading this, I hope you did too. I’m still just processing this nightmare I put myself into when I could have just waited a little longer.